By the mid 19th century naturalism in jewellery had come to include movement. Flexible or coiled stalks (tremblers) made the flowers and fruit quiver and glitter when the wearer moved. The larger floral pieces created a glamorous display on grand occasions but could also be dismantled into smaller, more wearable elements, such as brooches. Floral jewellery made a touching gift of love or friendship. It could also convey symbolic messages. In The Language of Flowers, first published by Mrs Burke in 1856, the lily of the valley signified a return of happiness, while the convolvulus could have a number of meanings – from the bonds of love to repose or even extinguished hope. 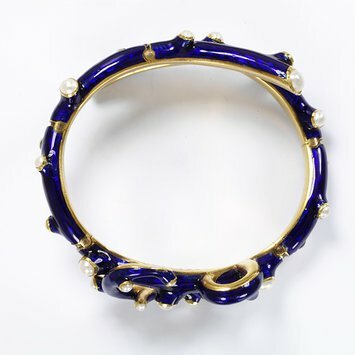 Rusticated bracelet, enamelled gold, set with pearls, in the form of an entwining branch.